What Is A Valkyrie Voyage? Valkyrie Voyages are week long retreats on live-aboard ships. voyages approach healing from a holistic point of view focusing on our program's three pillars: Mind, Body, soul. We see these three aspects of health and healing mutually inclusive of one another thus each day is specifically designed around this concept. to claim that our program will cure a veteran would be DISINGENUOUS and irresponsible. Each of our participants are unique and their trauma is just as unique. however their common bond of service and sacrifice allows us to present a road map towards healing. participants are provided more than 20 hours of group and individual counseling sessions that are facilitated by a licensed counselor who specializes in trauma counseling. Our three counselors each bring their own unique experiences from their time in the military. as a navy combat fighter pilot and advocate of alternative therapy, jeff BELIEVES in our mission and knows the positive outcomes of this type of an intensive COUNSELING program. Julie and adam both served in the marines throughout numerous combat zones. Together, these three are able to connect and bond with participants in a unique and special manner. these counseling sessions were written and developed specifically for our retreats and help veterans to define trauma, identify and recognize it in their lives, and offer tools to manage its effects. regardless of the situation they are in, PARTICIPANTS can leave confident that they are better prepared to manage the effects of PTSD in their daily lives while having reconnected with veterans going through the same struggles. even with many physical and trauma related injuries, swimming, snorkeling, and scuba diving all have known positive effects for the body. improved blood circulation, strength and endurance are just a few. the near silence EXPERIENCED at depth, increased pressures and the regulation of breathing are conditions and EXPERIENCES drawn upon during times of heightened stress to allow for calming by the veteran. 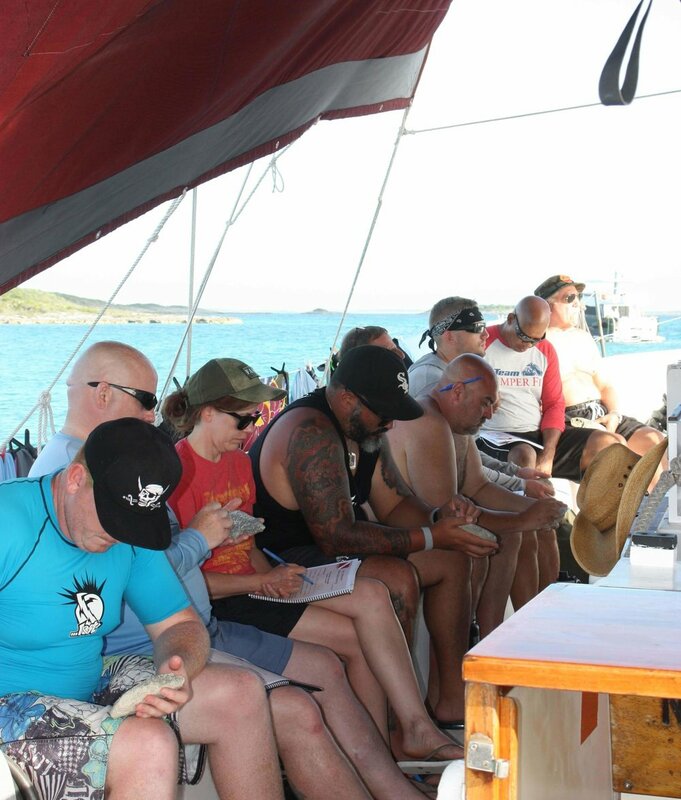 PARTICIPANTS will conduct up to 20 dives over the week and experience coral reefs, ship wrecks, plane wrecks, nigh dives, drift dives and a shark feeding! this is an amazing way to show healthy ALTERNATIVES to chemical dependency as a method to reduce stress and be active again. as a christian based organization, we know first hand the powerful healing found with a healthy soul. daily devotionals are led by a military chaplain or representative and focus on the lives of historical figures. These discussions follow their paths in times of war, experiencing trauma and how that trauma played out in their lives, the healthy and UNHEALTHY choices made and the consequences of those decisions. we use these stories and PARALLEL them within the lives of our veterans to seek out and formulate a new path of recovery. participants do not need to be of any faith but are expected to remain respectful of others and participate in discussions as it relates to their lives. if you have any questions or concerns, please click the ‘inquire here’ button below.